I got a question tonight from a reader of this blog about seal quality and as I was writing her back, I realized that there may be more of you out there who could benefit from a brief seal-testing tutorial. When it comes to canning, sometimes you miss the pinging sound that gives you auditory confirmation that your jars have sealed. Just because you didn’t hear it doesn’t mean that the jars didn’t seal. Here are some ways to test…. Press down on the center of the lid. Does it move up and down or does it feel solid and concave? Solid and concave means a good seal, movement means no seal. Tap on the lid. Does it sound tinny or hollow? Tinny means sealed, hollow means poor or no seal. Unscrew the band you used to hold the lid in place during processing. Now attempt to pick your jar up holding onto nothing but the lid. If you have a good seal, you should be able to do this easily. You’ll know pretty much right away when you remove the band whether your seal is good. How else do you guys check your seals? And, while I’m answering questions, who else has got one? It’s not a question, but more of a request: I was always very intimidated by canning, because the books made it seem complex and error-prone. (Especially considering the threats of botulism!) When I canned applesauce, I was surprised by how easy it was. What about a post that emphasizes the ease of canning and breaks down the fear? It’s possible you already have such a post in the backlogs. Dining out at a restaurant is more hazardous to your health than home canning! Hope this helps! So I just canned apple butter for the first time ever and I heard one ding but no others. Most of the jars feel pretty solid, however one sounds hollow and when i press on the middle it does not feel solid. My jars are still warm so can I do another water boil bath in hopes that the jars will seal? Or do I not worry about it? They are gifts so I want them to be safe and good. Thanks! You need to let them cool completely before testing the seals! If some don’t seal, follow steps 8, 9, and 10 in this post. I too made applesauce recently. All the jars sealed very well, in a couple the applesauce came up and out of the jar a bit before sealing. I imagine there is applesauce caught in the lid seal area. I can pick the jars up by the lid edge, so they are very tight, but are they really ok? I was wondering if you have any handy tips about adjusting processing time if using a different sized jar than called for in a recipe. Is there a rule of thumb on this? Yes. If the recipe gives you processing time for pints, that processing time is good for 12 ounce, half pint, 6 ounce, and quarter pint jars. If you’re increasing the size of the jar, you add five minutes to the processing time. 1. Tiny bubbles appeared in my applesauce a day or so after canning. Is this normal? 2. Got any ideas for fresh cranberries? 2. Check the recipe index. There are several cranberry preserves over there. I know lids can only be used once if sealed onto a jar. But if I heat up lids in hot water to prepare them for use, then don’t end up using them because my recipe didn’t fill as many jars as I expected, can I cool those lids and use them another time? You can use the lids over and over again. Erin, it’s actually not advised to reuse the lids. Jars and rings, yes. Lids, no. Soooo, with regard to the original question, can you still use a lid that was heated but not sealed onto a jar? You can use a lid if it was simmered in preparation for use, but then ended up being unnecessary. As long as it wasn’t applied to a jar and run through a boiling water bath canner, it is still good. My mother told me about canning when I received some green tomato relish from a friend and my husband loved it. She left out the part about not being able to reuse the seals and I did. The seals did seal because I heard the pop, so is my relish ok to eat? It’s okay since the jars sealed, but it’s not ideal to reuse the lids. Thanks, I won’t make that mistake again. I always just let them cool and put them back in the box to use next time. I never “re-use” them. You cannot use lids over and over again. Rings and jars can be used again, but not the lids. The lid is a one time use item. If you are not sure, call Jarden to verify what I am telling you. If they were just simmered and not actually put through the BWB, you can use later. What in the world is this a picture of? It looks like it says “FisucatisFun”…??? Those are German lids from Leifheit. So it’s some German word. I believe that jar says, “FruchtigFun”…which means something like “Fruity Fun”. 1) I am curious about the processing time changes for changed bottle size, too. For example, I made the Octoberfest Beer Mustard in the big Ball Canning Book. The recipe calls for 4-oz jars, so that is what I made. But, I would rather make 8-oz jars (for gift giving). But, I didn’t know what would be safe. 2) I made the Ball Canning Book recipe for curried apple chutney, but got only 7 quarts plus one 4-oz jar (not the expected 10 quarts). So, it is more like curried raisin chutney (still tastes good). I figure that it will be ok, since the seals are all good AND it has enough vinegar in it to make the 10-quarts. What do you think? I could throw it out and try again. 1. If the recipe specified 4 ounce jars, it’s best to use them. 3. I’ll have to look for that one! I wandered over here at the recommendation of a friend — and boy, am I glad that I did. This is like HEAVEN for the skeered little canner girl in me! I have fond memories of waiting for my mom’s jars to “ping” after a big canning project. She always made it look so easy! But, I’ve suffered pretty seriously from “canning anxiety” (see comment #1: I think we’re psychic sisters). So, my question is — how do I can my own creations? That escabeche I love so much? The salsa I can’t get enough of? Aren’t there worries over having ENOUGH acid or somesuch? What about my favorite marinara? My over-analytical brain always wins out and keeps me from moving forward with canning. The bottom line is that you can’t always can your own creations. You cannot can your own creations and if you do then you would be well justified in being skeered. Use only approved recipes and follow them exactly. A student in one of my canning classes suggested removing the ring and turning the jar upside down- A gutsy move, but I suppose that’s one way to check a seal!! I have the same question as Elaine–I’m always heating up too many lids, then I’m not sure if I can reuse them… Would love to know! I’d also love to hear that elusive “ping” sometime! I was just told that if a canning recipe calls for lemon juice I should always use bottled lemon juice for acidity control. Is that true? I’ve always just used real lemons and wasn’t aware that was a problem. When you’re using lemon juice to ensure acidity, you always use bottled. My Mom always taught me to listen for the “pop” especially on low acid jars like tomatoes. I second Lo’s question, how do you figure the times on home creations, and do you have to use a pressure canner instead of a water bath in some cases? You do not figure the times on home creations because you do not can home creations. Get the Ball Blue Book of Canning and learn all about canning. Use approved recipes and follow them exactly. You can reuse the lids that you’ve heated once – I checked with the extension service on that. You just can’t reuse lids that have been sealed on a jar. As for testing for a seal, I always test the “button” on the top of the lid. Although, sometimes it will seal and then lose it’s seal (rarely for me) and those jars either get used right away or the contents tossed. Lids can be heated, cooled, and reused. Remember, you want to heat the lids prior to use, but do not use boiling/simmering water as that will melt or ruin the rubber ring under the lid. As Liz stated, you can always use a smaller jar and process for the same time, but you cannot go LARGER if the recipe does not call for it. Bottled lemon juice should always be used as it has a tested and consistent level of acidity. Fresh lemons actually change in acidity levels depending on the variety…some Meyer Lemons are actually sweet! Lastly, remember there are cooking recipes and there are canning recipes…they are NOT one in the same! Always use a reliable and TESTED recipe from a reliable source. Very few people who are aware of the safety guidelines regarding home preserving “make up” their own recipes. Boiling water bath recipes and pressure canning recipes are not one in the same and have different standards and requirements due to ph and acidity levels in the food. We just canned applesauce as well over the weekend. Not nearly as intimidating as I thought. It was very cool to hear the pop when they sealed. I have 2 questions and a suggestion. Is it safe to can those things, do you know? Liquid plus nut, stick, cloves, peel, ginger? I hope none of them overwhelms the flavor of the others, too. I boiled the small jars of liquid for about 20 minutes, just guessing that would be safe; there was lemon juice in with the apples as well so it should be acidic enough, I hope. And, second question is about sealing: I didn’t have time to cook AND can on the same day, so I refrigerated the full cans for a day or two or three and then re-heated the jars (without their metal lids) in the microwave before putting the lids back on and putting them in the about-to-boil water. So, I tightened the lids a little extra, figuring they were cold and not hot and thus not as expanded as they should be, but I think it was still not tight enough, because those little jars didn’t “pop.” When I went to check on them and touched the lids with my finger to check, THEN they popped and stayed down as soon as my finger touched them (before I pushed down, just touched them), and then I tightened the lids which seemed rather loose. So, have you ever experience this, and do you think it’s safe, since they did eventually seal? No, no and no. Approved and tested recipes only. Cook and can on the same day only. Don’t touch the seals for 24 hours. It’s also good to store jars with no rings on them. That way it’s obvious which seals are bad, or go bad later. I also have a question about Quattro Stagioni jars; have you ever used these? I bought a few up in Maine over Thanksgiving, just to try them out as they are pretty and I’m getting quite sick of the quilted Ball jars (they only kind I can find near me). The half-pint size take a regular-mouth Ball jar lid so I may just try that next, but wondered if you had any tips. I have been pickling and making jam for years, and I was learned from my grandmother and mother…so lots of experience there. I re-use my lids each year UNLESS they become stained or just don’t look right. The re-used lids seal fine and no one in my huge family has ever gotten sick. I am a big believer of re-cycling whenever possible! Kate, like you, I learned from my grandmother about canning. I was taught to re-use the good lids. I have re-used lids 3 seasons with no issues. After 2 or 3 uses the rubber seal gets thin and may not seal. I check all the lids for any blemishes and make sure the red seal is thick and in good shape. Any bad lids I put an x on and use them for freezing or storage. I have been doing this for over 34 years and I have only had about 5 not seal with re-used lids. BUT, I had a whole batch not seal with brand new Walmart lids this year. I process about 200 jars a year and no one’s died or gotten sick. Thanks for the great info. I canned some salsa and right when the cans came out after processing and were still piping hot, I touched the top of one of the lids (bad, I know!) and manually popped it in. I hardly put any pressure on it and it went right in. I am almost sure it would have done it on it’s own as it cooled. My question: does the seal count? Yea! !…that just happened to me tonight with blackberry jam…3 of them popped as I was testing them. Probably will still check the seal though. I too just used Quattro Stagioni jars – I think they were half pint and I made a lot of plum jam. Perhaps I did not follow their instructions – Instead, I did as i had done with the Ball jars and immersed them when full of hot jam into the boiling water. I saw 3 of 7 did not pop – the little button on top was not depressed but raised, and so i decided to process them again – and to be safe did 15 minutes. I heard all pop when they came out. however, there were three that looked like the button was up this morning and i found the lids loose. I had put them in with loose enough lids – (finger tight as some say though that term is very unclear to me) – and perhaps i was supposed to screw them on very tight? If not, do they tighten up while being processed??? Now i have been looking for hours today for answers on how to properly use these jars and have them seal. I am hoping to get answers here. I have refrigerated the jars that did not seal, but could not eat all that jam – maybe in a month 🙂 So, do i have to use new lids? buy more lids? and reprocess? Is that safe? How much time can pass before i reprocess if safe? They have been in refrigerator except for the first night when cooling. I did not let these jars cool down with water as some other posters mentioned; I took them out after 15 minutes from the canner. In addition, I now have 2 flats of Damson Plums, plus big bowls of Flavor King and Elephant Hearts macerating (overly-eager i guess having just discovered how to can), and am wondering if i need to return to Ball or other jars as I had no problem with any of them. Please advise – I don’t want to lose all my good plums…. Are we just not taking the correct steps with these jars? Should I screw on the lids very tightly before immersing? Should the water be luke-warm when immersing? Boil for 10 minutes or as recipe indicates – and then let them cool in water? If so for how long? Does anyone use these successfully and if so can you post in detail what steps you take – and with those jars that do not seal. There must be many of you who know how to process these jars without having this happen? I’d love to make my first batch of Damson Jam in them! I ordered the Damsons from a local farmer and picked them up today – so would love some help with these jars till my Weck order arrives. (Hopefully I get the knack of using those!) Thanks! You can certainly reprocess the jam. You have to start over, though. Empty the jars into a pot, heat the jam, refill the jars and reprocess. I did test #3 to the applesauce I processed yesterday and I was able to lift the lid with the jar attached for a moment, but then it popped off and spilled all over my counter. Would that been enough of a seal? I opened a sealed home-canned jar of my tomato sauce with my nail and there was no pop. Is this bad. I thought it smelled fine and am cooking with it now. Any suggestions? Kris, if the jar did not appear to be well-sealed upon opening, it’s probably not a good idea to eat it. Am I the only one who is scared to pick my jars up by the lid? I suppose I shouldn’t be. It just sounds like tempting fate! Also, Marisa, in case this comment brings you back to this thread, you have some interesting unanswered questions above, such as, what is in this photo with the interesting name on the lid? Kristin, if you wait until the jars are fully cooled, the seal should be so strong that it will hold tight and fast. Also, you’re not waving it around your kitchen. You’re picking it up an inch for a second or too. i made heirloom tomato jam today and canned for the first time…i followed instructions from a friend who did not tell me NOT to press on the top of the lids when the jars came out of the 15 minutes boiling process to finish the jarring. i was so excited..i wanted to see if they had “popped”…well, i pushed on each one while they were still hot and found they had all a little give in them… and then came to your website where i read, let them sit..so i did..and i heard a few pops in the kitchen ( which i must say brought a smile to my face)..i only heard two..but when i went back about twenty minutes later and i pressed on them all again to see which one had popped and they had all gotten tight. with no give…so now i don’t know if they are good or bad or if i pressed the air out and there is no seal…what do you think? You didn’t push the air out of the jars. If the jars sealed, the seals are good. You can’t force a jar to seal if it’s not going to. So don’t worry about it. I was canning pickles and as soon as the come out of the water bath I touched the top of one. It immediately pinged down but I am afraid it was because I pushed on it a little. It does not go up and down when pushed but is this a valid seal? I’m a little concerned. I didn’t touch the two other jars and they sealed perfectly. What do I do? I see that a lot of people say that you have to use lemon juice in the bottle. Part of the reason that I’m home canning is that I’m allergic to the juice in the bottle. (It contains sulfites, and along with other stuff in commercial jams/jelly, it makes my tongue swell and my throat swell). any suggestions for testing acidity? So, if you can’t touch or test the seals for 24 hrs, how do you immediately refrigerate any jars that didn’t seal? Also, I have always tested the seals by using my fingernails and seeing if I can lift the lid. In the latest round, 2 of 3 jars the lids lifted, but there was a “sucking” sound. The “buttons” on the lids had gone down, but I didn’t HEAR the popping, and when I pushed on the lids they didn’t move. Were the jars really sealed? The other jars would not open with my nails. Am I inadvertently opening sealed jars? I have kind of a silly question.. Will checking the lids too early by pressing on them affect the sealing process? I got a little excited, and pushed a couple before they cooled.. 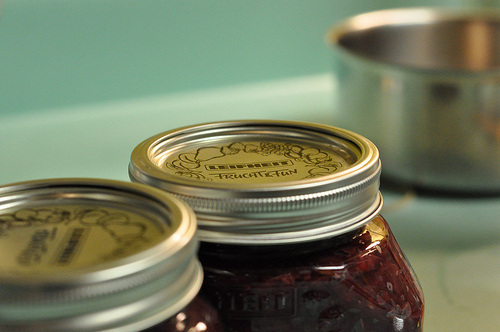 Pressing on the lids won’t cause jars to seal if they weren’t going to seal on their own. I canned applesauce a month ago. Today I happened to hear one of them pop and when I checked, the seal was broken. Is it safe to assume that it just popped and put it the fridge to eat it? Or should I just throw it away? I just canned apple butter for the first time. The lids have drops of water attached to the bottom side of them. I’m guessing due to steam from the apple butter or from putting the lids on the jars when they were slightly wet to help the seal. Is this okay? Also, do you recommend wiping the rims of the jars with a wet cloth to help them seal or taking the lids directly out of the boiling water and putting them on the jars wet? We originally tried to dry off the lids and then put them on the jars, but none of the lids sealed properly that way during our first 3 batches of apple butter. We are going to boil the apple butter again tomorrow night and then try the canning process again. Hoping to do it right this time around! Anna, don’t worry about the small amount of condensation in the jars. If the jars are sealed, it won’t do any harm to the products. I recommend wiping the rims of the jars prior to putting the lids on. You to this to insure that there aren’t any food particles on the jars that could compromise the seal. You don’t need to wipe the lids off before applying them to the jars, though. They should be hot enough that the water will evaporate readily when you pull them out of the simmering pot. If you’re having sealing problems, it could be that you’re not leaving enough headspace. Because it’s so dense, apply butter needs a generous 3/4 inch of headspace to seal properly. I have a question about pickling. I made pickled peppers and did a water bath for 15 min. The jars were sealed and then became unsealed so I used new lids and reboiled them. Those also sealed and then unsealed so I pushed on the button and tried screwing them tighter. After that they did seal, with the little button down. I let them cool a little and took off the rings. I pulled on the tops and they stayed. They seem like they are fine and that they are sealed but I am nervous that they aren’t safe. If they are sealed and the button is down, should I worry? Thanks! Amanda, I’m a little confused. How long did the jars sit before they unsealed? I’m not sure why they would be sealed and then unsealed like that. Unfortunately, after a couple rounds of water bath, the texture of those pickles is not going to be good. I did pickles this year that sealed perfect according to all the above statements. They pinged, 24 hrs took rings off and wiped down, put labels on and shelved. Here’s the issue. If you put them sealed in the refrigerator they will ping and unseal after they get cold. Is this normal? Has anyone else had this problem? First time I ever come across this since I never put sealed jars in the refrigerator before. How long does it take for pickles to seal the jar? I made 14 day pickles that do not require a waterbath. Just heat the pickling mixture and put in the jars? Many thanks for any suggestions. I have no experience with 14 day pickles and don’t recommend any process that has you skip the waterbath. A friend of mine does the pickles without the water bath. Hot jars,hot lids, hot contents. That’s how her mother and grandmother does it. I haven’t tried but she has 100% success and no issues. Still, it’s not recommended by the USDA. I have a question about jam that’s been in storage. I just took a couple of jars out and the button is no longer sucked down, but the lids are tight. I am quite sure the button was down when I put them in the cellar. Any idea why this happened and if they are safe? Press up and down on the lids. Do they wiggle? If so, the vacuum is no good and the contents should be discarded. Seals go bad for any number of reasons. Please help!!! I canned a zuchinni relish and let them set for a couple of days thinking they sealed and they didn’t. Can we still eat the relish? Tammy, you have to be the judge of that. They are probably just fine, but only you can determine whether you feel comfortable eating them or not. I’m just teaching myself how to can. Yesterday for my second attempt, I made a batch of nectarine chutney, and then some oven roasted nectarine butter. A few questions re the latter. 1) I got the recipe for the nectarine butter off the net, from someone’s cooking blog, and had been listed on a larger canning blog. But, reading through this thread, it occurs to me, how do you know if a recipe is an “approved and tested” recipe? 2) The recipe just called for roasting the fruit until soft, mashing, optionally adding sugar and spices to taste, then canning for 15 mins in a hot water bath. Should it have had lemon juice to make it keep? 3) I realize now that I didn’t leave enough headroom. The butter rose to the bottoms of the lids, and there are small traces of fruit on the outside of rims of the jars. But, the lids don’t move, are concave, and tight. Are they really sealed? Sharon, that nectarine butter sounds like a recipe from my first cookbook. As long as you used yellow nectarines, they already have high enough acid levels to be safe for canning naturally. It is natural for fruit butters to expand during canning. As long as the lids are firmly in place and concave, the seals are good. How long should it take my cans to make the pinging sound? And if I press my lid to see if its sealed and it collapses under my touch but doesn’t spring back up… is that okay? If the lid pops down and stays down after you gently tap it, it is fine. Jars typically take between 30 seconds and two hours to seal. I recently canned salsa and some of the salsa leaked out of the tops while in the water bath. The lids appear to be well-sealed but I worry about food being caught in the seal and what that might mean for the safety of the salsa over time. Should I be concerned (and perhaps re-do this batch) or just hope for the best? Thanks! I’m quite new to the canning scene, but I made my first batch of canned tomatoes the other day! One of the cans didn’t seal properly, but I noticed this after the can had been sitting on the counter for a day. Can I still use the tomatoes if I keep them in the fridge and use up the can in good time? Or do you think some bacteria could have grown in the time that the can was sitting on the counter? If it was just a day, I think the jar that didn’t seal should be just fine. First timer here! I am being neurortic, especially since it’s been 3 days since I processed my crushed tomatoes and peach jam. I used a water bath canner. I am scared the jars did not seal properly. I added 1.5 tbsp lemon juice to each 1.5 pt jar of tomatoes, and processed them for 40 minutes. I added 1 tbsp lemon juice to my pint jars, and processed them for 35 minutes. I followed the recipe in the no sugar added sure-jell box and processed my peach jam for 10 min I live about 900 ft. above sea level. There is no motion when I press the tops, and I can hold the jars by the lids when I take the rings off, but I am not hearing a “tinny ping” when I tap the tops of my jars of jam and crushed tomatoes. I have a jar of pepper jelly (different shape) someone else gave me and it “pings.” Should I be concerned that mine do not do the same? Your jars are sealed. If you can remove the rings and hold the lid by the edges of the jars, the seals are good. The sound of the lid is meaningless. I was thinking of making a Spicy Peach Salsa. Is it safe to subsitute mango and pineapple out for the same amount of peaches. All the other ingredients are the same. Only thing different is replacing equivalent mango and pineapple to go with the peaches. I am new to canning so I am not sure if this is ok.
Just worrying about it now and don’t want to be risking botulism. It’s honestly not the best idea to make substitutions in canning recipes. How do you know if you have a false seal? I jarred my first batch of spaghetti sauce recently and I checked all the lids by doing the lift without the ring trick once they cooled down. They were all tight. I had the same problem – all my applesauces appeared to be sealed, but I was able to pull the lid off. I thought that you needed to be able to use a can opener. Throwing everything out. Very discouraged…..
You don’t always need to use a can opener. How much force were you exerting in pulling off the lids? And how long did you let them sit before you pulled the lids off? I made applesauce, took it out of the kenner and 2 the jars lids had not popped. I pressed the button of one lid down with my finger, and it stayed down. (Yes, the jars were still very, very hot.) but the second lid did not stay down. So, since it was late, I put it in the refrigerator. The next morning, the button on the lid was down. Is it safe to store with the other jars,or should I use/ put back in the fridge? It is probably fine to take that jar out and store it in the pantry. Applesauce can sometime be slow to seal, so it may have been that the jar would have sealed within 20 minutes or so of coming out of the canner. Although my jars appeared to be properly sealed and dented in, I could open the lids with my fingers – is it safe to eat? Usually I have to use a can opener. Did you have to exert some force while opening the jars? Then they are still fine. Sometimes you can break the seal using your hands. Can I seal the jars by the heat of the content alone because I’ve done that and they sealed, made a popping noise and everything and they’re completely sealed without the water bath, is that ok? I sanitized my jars and lids first. It’s actually just fine. I can my pickles without giving them a water steam at all. I do not punch them. I make sure sanitized from my dishwasher then pack quickly. Then poor vinegar mixture of it. Make sure the lids are dry and immediately turn them over. Leave them and be patient. Works every time and I’ve never had a complaint. It’s really not fine for home canning. I have about 5 out of 9 that are doing this and I have done taken off the lid recleaned it and wiped the top of the jars clean again and placed them in boiling bath twice. Stacy, how long are you letting the jars achieve full seal? You need to let them seal for at least 24 hours before you take any action. And are the lids actually moving up and down? Or is it that there’s just a tiny bit of give? As long as they’re concave and don’t actively pop up and down, they are sealed. A tiny bit of give is okay. Up to a couple of hours is normal. As long as the jar seals during the cooling process, it’s okay. I just made a batch of rhubarb jam (first time canning by myself) – and after I let them cool for 24 hours, I tried picking each one up by the lid only. One jar had a tiny bit of give in one spot, but it still stayed sealed. Is the seal still good enough to be safe? The lid can have a tiny bit of give, as long as it isn’t clicking up and down. If the seal held when you lifted it holding the edges, it should be fine. Sorry, just to make sure – the seal held when I lifted it holding the edges, but I did feel an edge of it loosen (or the jar moved downward a bit while holding it up by the lid) – is that what you said was still okay! Liz, if it felt like the lid was loosening, then the seal is not good. Did you give the jars 24 hours to seal before you started checking the seals? They need to be fully cool before you start testing. I did give them 24 hours, so I’ll reprocess it in a new jar and hope for a tight seal this time! This evening I canned 12 pints of dill green beans. i did not hear any of them ping. The lids do appear to be pulled down (concave). Tomorrow (24 hour) I go through your 3 tests. If some did not seal you said I can reprocess. Can you go through the steps I would need to do to reprocess. Thanks. I’m a little bummed, I love hearing the ping. The ping is not the best indicator of seal. If the lids are concave, I bet they’re sealed. Hi!! Tonight was my first time canning, and I didn’t know about the do not test the seal rule until 24 hours. I tested mine while still hot… Did I ruin them? What can I do? I’m really worried I messed everything I did up, thanks!!! Did the lids come off when you were testing the seals? If so, they are ruined and will need to be processed again. But if the lids stayed in place, all is well. one of my jars had not popped yet but I touched the top of it and it popped in is it ruined that I did it myself and it didnt do it on its own ? As long as the lid remains concave, the seal should still be good. Sometimes, you just happen to touch it just as it was going to seal. I’m glad you asked this because I just did the same thing! I thought they looked concave all except the little button so I touched the tops and they all went down! They had been finished about an hour, so I think I got too anxious. I’ll be testing my seals tomorrow! YES was looking for the answer to this question, too. Thanks! I did the same thing. I’m so glad I found this info. Thank you. I was canning hot sauce and did a boil bath for 30 minutes. I let the jars completely cool down for several hours then I did the finger test. As I did the finger test some jars were not sealed but the lid did not pop back up creating a seal. All the jars seem sealed now as I did the finger test again the morning after. Could they be sealed properly now? Yes. Sometimes jars take up to 12 hours to fully seal. Don’t test seals until the jars are cool. How long does it take pickles to seal properly. I made them last night. Finished canning around 11pm. This morning at 8am i tested some of them did not realize about the 24 hour rule. Some of them popped down as i touched them. Does this mean that the seal failed. Do I need to reseal them. I will will test them when i get home. I Believe you mentioned if you catch them within 24 hours still okay to reseal them. I am correct in understanding this. Any jar should seal as it cools. My guess is that your pickles did not seal. Unfortunately, resealing pickles is a tricky prospect, because when you can them a second time, you seriously impact their texture. If it’s not a huge batch, I’d suggest popping the unsealed jars into the fridge. Ladies you might want to go to Jardin and read about their new seal procedures. They are no longer recommending that you boil seals. This applies to water bath, which they state when overheating the seal in boiling water the plastisol spreads out too thin. So they recommend that you just simmer lids and you should always cook foods 10 minutes or longer to take care of sterilization. They also state that when you are you pressure canning that you can get a good seal because the plastisol when heating against the glass rim gives a good seal. Their new boxes reflect this change but as we know you should buy from a store that does not pull out old stock that they don’t sell during canning seasons. After sealing my jam, I noticed that when I taken the ring off, there was some jam around the edge. The jar is sealed, did I do something wrong or is it ok? That kind of minor leakage during sealing is normal. Just wash the jars in some warm, soapy water before putting the maway. One of my jars sealed before I could get it over to the water bath (it pinged and is concave). If I process it will I ruin the seal? It won’t ruin the seal, because that initial seal you got was a weak one. You should still process the jar. I water bath canned some pints of dill pickle chips. Let them cool and noticed the popping of lids a couple hours after I took them out. I didn’t realize the 24 hour rule until just now though. I did happen to wait until they were cool to the touch though. When I had touched one of the tops, it went down and stayed down. I’m hoping that one ends up being ok. Will wait until the 24 hour mark before trying to lift it though to make sure. My main question: one of the jars that popped on its own is a bit hinky. The center is down and there’s no give at all, but around the outer area of the lid I can press it down and there’s a moderate amount of give. Should I reprocess immediately or wait longer and then test? If it makes any difference I’m using Walmart Mainstays jars and lids. Perhaps it’s just because the lids seems a bit thinner than Ball and Kerr lids? All that matters is if the center is down and the lid stays adhered once the ring is removed. I made 8 half pint jars of spiced apple butter tonight (water bath). After 1 hour, 6 had popped and sealed while 2 didn’t. I lightly tapped the top of the two that hadn’t sealed yet and they went down and stayed down. If I need to re process those 2 that’s totally fine… The only thing is that I have a pantry full of canned goods that I have “helped along” by popping them down myself… Dun dun dunnnnn…. Am I totally screwed?! I didn’t know about the 24 hour rule until tonight! If they popped down and stayed down, they’re probably just fine, even if you helped them along. how long do I need to let jars seal. I made relish. The relish was slightly cooled when I put in jars. Brand new jars and lids. Rims checked and cleaned. Jars are not sealing after 20 minutes or so. Should I be worried and can I reseal the next day in hot water?? Help! I just put up a half gallon of cowboy candy and was getting anxious thay I hadn’t heard the lid seal after an hour or so. In pushing down on the lid my heart sank as it moved with ease. I removed the ring, and found that, somehow, I’d used two lids! In testing with the pick-up procedure, however, the bottom lid held fast in lifting a half gallon jar of peppers and syrup. It also could not be depressed, so with much relief I returned the ring and placed it on a shelf. I’ll, of course, retest in 24 hours. okay, so I made canned tomatoes. the lids seem to be sealed good and I can lift from lid and it all staying on good. BUT most jars have floating Tomatoes and some have tomatoes that sunk and taking up the whole jar. What does that mean???? are they sealed? and ready for storage? Thank you! Hey there – I LOVE YOUR SITE! This is my first year jamming and you’re right – it’s wonderful!!! I have a jar that I made and sealed a week ago. This morning I realized that the center had popped back up…I thought I was seeing things so I pushed it, and it stayed in easily and isn’t popping back up. When I try test 3, and hold the jar by the lid – it’s definitely still totally sealed. What do you recommend? This seems bizarre – but maybe it’s just on it’s way to spoiling? I put it in the fridge for now. I read through the other comments but didn’t find anything about this specific scenario… Thank you hugely for following your passion here – and sharing it! This is wonderful!!! If doesn’t matter of the sealing compound continues to hold. If there’s no reliable vacuum seal, that jar is suspect. So, I have a batch of blackberry jam that I canned during the summer, which I processed in a water bath, and all the jars sealed correctly. I think. The lids are very firmly on, and all the buttons went down and stayed down without my touching them. The rims are on very loosely, so they’re not holding the lids down. The thing is, when I opened a jar, I broke the seal with a bottle opener, and the lid came off with a sucking sound (indicating a seal), but the button in the center of the lid didn’t pop back up. I tried opening a second jar and the same thing happened. Is this a problem? The buttons will pop up if I tap them with my fingernail. The jars are stored in a very cold pantry — could the cold be making the lids stiff? Do you think the jam is okay to eat? It’s fine. The force of the seal often bends the metal and keeps the button popped down. I just made cranberry-Apple butter and one of my jars didnt seal. Since I left them overnight, it’s completely cooled. Can I reprocess cold or do I need to reheat the contents and jars and start over? If you only have one jar that didn’t seal, here’s what you do. Remove the lid and ring. Wipe the rim and put a new lid on the jar. Place the jar in a pot and cover it fully with cold tap water. Set the pot on the stove over medium heat and slowly bring it back up to a boil. Once it’s at a rolling boil, process for the amount of time instructed by the recipe, plus five minutes. We use it for freezing food, leftovers and I package drugs, select foods and supplies for storage. You will not regret this purchase. A lot better than mylar bag storage. Yesterday, I made my first attempt at canning to preserve a too-large batch of salsa verde. I have four jars and while three seem to have a good seal and pass the “tap” test with a tinny sound, one has a dull thunk. The one with the dull thunk seems to otherwise be sealed (although I will recheck this now that it has had more time to sit). I’ve read online that the dull thunk sound can be because the seal is poor or food is touching the lid. I’m also working out of the Ball “Home Preserving” book, but it doesn’t really address this test for seal quality, which leads me to believe that maybe it’s not a perfect test. Is it possible to still have an adequate seal with the dull ‘thunk’ sound? If not, can I get away with reprocessing the jar, or should I throw it out since it has been unrefrigerated for 24hrs? The sound of the lid isn’t an accurate way to test for seal. Do this instead. Remove the rings, grasp the edges of the lid and lift the jar an inch. If the lid stays firmly sealed, the seal is good. If you feel it starting to give, you can either reprocess it or just refrigerate it and use it first. The fact that it sat out for 24 is fine. That’s not enough time to have spoilage in a high acid preserve. Lifted them up by the lid and they all seem to have sealed! After taking the rings off I could clearly see the problem jar had salsa all the way up to the lid. I made sure they all had 1/2″ of head space before putting the lid on, so I’m not entirely sure what caused the difference with that one. For future reference, is it possible that air bubbles could have caused it? I did notice that I could see some air pockets in the salsa in the problem jar while the others did not. Sometimes salsa expands a little in the jar. The air bubbles shouldn’t have caused the expansion, though. I made 2 batches of jam, the first batch of raspberry I put the liquid pectin in too soon, I put it in the beginning, Is it ruined? They all sealed? Them I tried a second batch of blackberry jam and I did not read the don’t tilt or move for 24 hours, are they o.k.? Everything sealed but I was cleaning the jars moving them around , old lady brain fart! Do you think they will be o.k. I don’t want anyone getting ill.
Julie, adding the pectin at the wrong time or moving the jars won’t make a batch of jam safe or unsafe. As long as you didn’t change the ingredients, it’s going to be okay. The only thing that could make that jam unsafe is if you added low acid ingredients like tomatoes or mango. The pectin error and moving them might impact the finished set a little bit, but the’s the only problem that might possibly occur. it looks as though some jam in my jars bubbled up during processing and is touching the lid. Is this a problem if all other checks are okay? Also there are little bubbles in the strawberries. i just made 10 jars of pickles but during the boiling 7 of them popped up forming creases in the lid. If I turn them upside down (after they cool, 24 hrs) and the seal doesn’t leak are they still good? or do I need to put them in the fridge and eat them within a couple of weeks? If all those lids creased, it sounds like you overtightened your rings. The air in the jars couldn’t escape naturally and so bent the lid in its efforts to vent. None of those jars are shelf stable. If a lid on a pickle jar creases during boil but does not leak when you turn it over the next day is it still good or do you have to refrigerate right away. If the lid buckles, bends, or creases in any way, that jar is not shelf stable and needs to be refrigerated. Made blueberry jam about three weeks ago using the water bath method. All the jars were sealed but I noticed that in some of the jars that the jam is moving around a bit. Its not loose, its solid but when I turned it over the whole lump of jam was able to fall down in one solid mass. Is my jam still safe to eat? That is entirely normal. Totally safe. I made pepper jelly. the cans sealed because they are concave and i held them by the lids like you said. However there is some sticky stuff on the outside of the jar. Is this a problem, are they safe to eat? The lid appears to be sealed. It’s fine. Just rinse any sticky residue off the jars before storing. It’s fine. You probably were just there at the moment they were already going to seal. Novice canner here. I was under the impression that once the jars were sealed the food inside would not slosh around. I just canned some carrot soup (ball recipe) and the contents of the jar move around when tipped. Normal? Hello! I am new to canning and just made first batch (med-hot peppers!). Previously I took a class and made jam and then my father in law taught me how to can peppers. In the class, while sealing the jars, the instructor held the lid down (depressed the button) while she tightened the ring. I do not remember my father in law doing this. So I have two different methods of sealing rings. Is one right or wrong? Will both ways properly seal the jars? Thank you so much! I would imagine that the teacher who held the lid down while tightening the rings was doing it simply to keep the lid aligned. Doing that has no impact on whether the jar seals or not. The thing that makes the jar seal is the pressure differential that is caused after you remove the jar from the canning pot. Hello. I’m totally new to canning and want to know if I can I reuse the lids or should I buy new? Hi. I was actually going to leave a comment on your https://foodinjars.com/2010/08/canning-101-why-you-shouldnt-can-like-your-grandmother-did/ post but there was no comment box, so I apologize if it’s not completely relevant to this post. I made some jam for the first time yesterday. I don’t have a proper pot to give a hot bath so I used a pasta pot that has an insert which can be easily removed. While the jars were all submerged, the water wasn’t reaching quite 1″ above them in the process. Do you think that the hot bath was still effective? I closed the comments on that post because it was getting out of hand. As long as the jars remain covered with water throughout the canning process, you’re good. They will keep 4-6 weeks. Hi. My lids have no give when I push on them. However, the sound when I tap with a spoon is dull. I canned nectarine halves and they floated to the top. How reliable is the spoon tap sound method? The sound doesn’t matter. You just want the lids to be solid and concave. Nectarines often float to the top. It sounds like your jars are fine to me. I tried canning salsa today and all my jars sealed but I have air bubbles in the jars… What do I do? I didn’t know about the 24 hour rule until I found your site. Super helpful info – thanks for that! 🙂 I made grape jelly for the first time tonight. Followed the Sure-Jell recipe to the letter. I heard a sound of a ping and thought “oh no! my jar unsealed!” (can you tell I’m a rookie?!) I checked, and it seemed unsealed…but now it has “resealed.” Should I just leave them alone and check after 24 hours? Is it possible they are still ok? If the jars are sealed, they are ok.
thank you so much! 😀 I’ve got 16 half pints of grape jelly, and all the seals seem good. So relieved! hi, if properly canned jars pass the 3 lid sealing tests mentioned above and become “magically unsealed” a month later-what happened? some of my peaches and tomatoes have been tossed out because of random spoilage. I don’t really know what happened beyond the fact that they spoiled. It happens. Are you doing the boiling water bath process for the proper amount of time? It often means that something spoiled in the jar. Canned 10 pints of dilly beans last weekend. 8 sealed quickly, 2 did not. Once jars were cool, but less than 24 hours later, placed the 2 unsealed jars in the fridge. A few days later, I discovered that both jars in the fridge had sealed. Are these good now for long-term storage or should I keep them in the fridge and eat soon? My feeling is if you did a proper boiling water bath and the jars have a good seal, they can be stored in the pantry. I’ve never heard of your third tip of unscrewing the band and attempting to pick up the jar holding nothing but the lid. My mom frequently cans and we eat a lot of the fruit when I visit. These are all really great tips to make sure that it is still good! I am canning for the first time but I am using jars of salsa jars I heated them in the oven turn them upside down turn them back in when I press on the button it went in but it didn’t come back out does that mean it’s sealed? Unfortunately, that’s a canning technique that’s not approved by the National Center for Home Food Preservation, so I would deem the whole process unsafe from start to finish. I made my fifth batch of jam and all my jars sealed. Today I drove to a different elevation with the jars and I heard a pop from one of them and it’s no longer depressed. Is this jar still safe to eat? Sometimes jars lose their seal. Jams don’t harbor truly dangerous micro-organisms, so if there was off-gassing that caused the seal to go bad, it’s not something that will kill you. I would give the product a careful once over in order to determine whether it was still good to eat. Look for signs of mold or fermentation. And then use your best judgment. Thank you for responding! I left that jar in the car all day and when I was taking it out I noticed that the lid was flat again. So I’m going to toss it out because I’m really unsure what’s happening with that jar. The jams were a gift for my fellow nursing student for nurses week and I would hate to make someone sick. Growing up, it was my job to knock the lids with my knuckle and listen to tell if the lids were sealed. I’m also good at finding studs in walls with that same knuckle. First timer , here just finished pickles in water bath, and all my seals are popped up, will they seal over cooling period? Or did do something wrong? The jars don’t seal until you take them out of the water bath and let them cool for awhile. Give them a little while. Does everything need to be cooked or heated before putting in the jars? I canned tomatos last night using the raw packed method and peaches tonight. The only heating was from the blanching. The tomatos pinged but the peaches did not after 2 hours cooling. I didnt realize I shouldnt touch the tops. I did press down and didnt feel any movement. If I can pick up by the lids after 24 hours am I ok? You pack things raw, but they do need a hot liquid (brine or syrup, typically), and then they need to be processed appropriately in a boiling water bath canner. If you followed an approved process and the lids are concave, you should be ok. Question for you … when placing jars into the canner, is it okay for the jars to momentarily be on their side – where the contents touch the lid? Sometimes I have had difficulty placing the jars in without this happening. How ’bout once you seal a jar, can the contents come in contact with the lid? Thanks for your help. It’s not ideal because it could cause some food bits to move between jar rim and lid, leading to seal failure. But that only happens occasionally. I’ve been canning for years, though I haven’t canned using wide mouth lids in a long time. Last night I cooked and canned plain tomato sauce. I followed the Ball Blue Book recommendations for tomato sauce and hot water bathed my pint jars for 35 minutes. I only heard one jar make the blatant “pop” sound. They appear sealed (lids concave and I can lift the jar by just the lid), but I am reminded that the last time I canned using wide mouth lids I hadn’t heard that “pop” sound I always hear when I can with regular mouth lids. Have you noticed this? Ball has changed the lids over the last few years, so they’re not popping or pinging as audibly as they once did. However, the real test is whether the seal feels strong and the lid goes concave. If those things are true, you’re golden. I have a question – I canned some green beans, and after they all cooled, one jar didn’t ping, and wasn’t concave. But the lid was tightly sealed, I put some pressure on it to see if it would pop off and it didn’t. That was last night… I pushed down on the lid and it popped down, and hasn’t popped back up. But I’m feeling insecure about it… is this jar sealed or not? Before I give you an answer, I need to know. Are these green beans packed in water or pickled green beans? And if they were green beans packed in water, did you use a pressure canner or did you do them in a boiling water bath canner? On my canned stewed tomatoes, seal is down but some (pints) look as if they have separated and water or clear on bottom. I made strawberry jam last weekend and all the tops sealed. However, today I noticed one was up and when I touched it, it went down and has stayed down. Should I throw this one out? 2) How long will the one with the crappy seal last in the fridge? They should sit for at least a week. And the one in the fridge should be ok for at least a few months. Canned pickled cabbage. All jars appeared to seal. Heard them ping and all are depressed or concave. Theres no give in the lid. However, at the right angle I can see a slight ring in the center. Are these sealed and safe? They sound safe to me. They are fine. That happens sometimes. As long as they stay down, they are fine. If they didn’t seal what do you do? If you caught the seal failure within the first 48 hours, you can either put in the fridge or try to reprocess is (though if the texture of your preserve is important, this isn’t the best option). If a jar isn’t sealed and it’s been awhile since you made it, it’s better to throw it away. Hello, i have made several jars of pickled beans and they all sealed until yesterday now i cannot get a seal? i haven’t changed anything and the pickled carrots seal it is just the beans that refuse to seal now. Could it be that you’re using a different batch of lids? Are you doing the boiling water bath process properly? There’s no reason that I can think of why your beans wouldn’t seal while everything else does. I made cran-blueberry jam recently and all four lids popped, so I felt sure they were all sealed. Days later, not sure how many, but under a week we discovered one lid unsealed. We immediately put it in the fridge, but are unsure now if it’s safe to eat. What do you think? I think it’s fine. The worst that can happen with that jam is a little mold. If the surface looks entirely normal, it is safe to eat. hi new to canning , I didn’t hear my jars ping and mistakenly touched them, they didn’t seal , right away I used a tea towel to help me push the centre down for a minute and the lids of now sealed and pass the lift test the next day . Are they going to be OK? I can’t judge the safety of your seal. You’re not supposed to touch the lids in any way, and holding down the lids is a sure way to give yourself a false seal. They can sometimes take as long as half an hour to seal. thx for the quick response, I am definitely going to be hands off next time. I panicked because every book I had said I should hear the ping right away . So even though with the bands off, when I lift the jar by the lid and it doesn’t come off its possible I have a false seal ? I just tried canning for the first time ever tonight. I made up a big batch of strawberry jam. I followed my recipe to the letter but I don’t think I got a good seal. I didn’t hear any kind of popping sounds when they came out and the button on my lid is still popped up. I pushed the button in on a couple of the jars before I decided to turn to google and came across your blog. Help please!! Did you process the jars in a boiling water bath canner for the proper amount of time? Was the water at a full rolling boil the whole time? Were the lids relatively new? Jars sometimes take 15-60 minutes to fully seal. If the answer is yes, you can always try reprocessing with new lids. I wonder if you’ll see this….if not, no big. I just canned a few jars of dilly beans this morning. I thought I laid out enough lids before jarring the beans and spices, so I was surprised that I didn’t have enough when I got to the last jar. I realized, seeing that one of the jars’ centers hadn’t popped, that I had maybe doubled up on the lids – two for one jar. I unscrewed the lid, and sure enough….there were two flats. I carefully removed the top flat lid, and the other lid was sealed. So, two questions: can I reused the lid that wasn’t really used as a lid in the first place, and do I trust the seal on the jar? You can reuse the second lid, and as long as the seal is strong, you can trust it. I made sand plum jelly yesterday. Upon removing them from the water bath, the lids popped down almost instantly. I’ve never had that happen so quickly before. Any thoughts on that? Sometimes that happens. The jars sealed. Why question it? I canned relish today. It was hot when it went in to the jars. Processed for 15 minutes. Some jars appear sealed when coming out of the bath. Can they seal during processing? It’s unusual for the jars to seal while in the canner, but if the tops were at all exposed, it is possible. I canned chokecherry syrup the other day. After about 12 hours only maybe half the jars had popped down. I just barely touched the tops of the ones that didn’t and they did pop down and have stayed down. I removed the rings and one lid popped up the rest stayed down. Do you think they are safe? Too much head space? If the lids have stayed down, they are ok. If they popped up, they should be refrigerated. Not knowing how much headspace you left, I can’t say whether that was the issue. I just canned pickles for the first time today – but didn’t use a hot water bath. I received the recipe off of you tube (maybe a mistake!) which had you heat the glass jars in the oven for 20 minutes at 250 bring the mixture to a boil, add the garlic and dill then pack the pickles without any touching the top, fill with the boiling mixture (water, vinegar, pickling salt) to the very top, close and then turn over on the top of the lid. I haven’t heard any popping sounds in the past about 3 hours, turned the jars back on the bottom and checked the lids most are down. A couple have very slight movement (which I probably checked too soon before cooling?). What would you recommend that I do? Next batch I will use a hot water bath to make sure it is a really strong seal. That is not a safe canning practice. Acidic foods (like pickles) need to be water bath canned to kill any botulism spores. Botulism can kill a person in a couple of days and is not to be messed around with. Please toss that batch and follow an approved canning recipe next time. Does the loudness of the ping when lids seal determine how well they sealed? I made salsa and normally the ping is quite noticeable. Tonight with this batch I did hear it but was slight. Thought maybe lids were not good. The loudness of the ping has nothing to do with the quality of the seal. Some lids seal loudly and some seal quietly. If they aren’t strongly sealed, they aren’t safe for pantry storage. Hi I have canned bread and butter pickles the last ones to come off hot water bath was late checked them 3 did not seal barely touched them and sealed should I put them in frig are they safe to eat. Thank you! Remove the rings and check to make sure that the lids are firmly sealed in place. If they are good, the seals are fine. Hi, I tried canning pickles for the first time ever on Friday. I didn’t realize I didn’t have a tall enough pot to water bath can them so after filling them all, I stuck them in the fridge. I got a bigger pot but is it now too late to water bath them? Also, they sealed in the fridge so are they safe to leave out of the fridge or do they need to stay in? To can them at this point would mean taking a major hit in quality and crunch. And even though the jars sealed, it will be a relatively weak seal that may not hold up on the shelf. At this point, it would be best to keep those jars in the fridge. Hi , my first time canning , I forgot to take the air bubble out on my green ketchup , look like they are properly seal , would it be ok? As long as the jars sealed, they are fine. Hi, I made some salsa for the first time. My jars seemed a little sticky after resting 24 hours. Lids are all sealed tight. Do I have a faulty seal somewhere? If so what should I do, since I can’t tell which jar it came from? Thank you. Sometimes jars leak a little during the cooling process. As long as the lids seems securely sealed, it isn’t an issue. Just wash the jars and store them in a cool, dark place. I don’t have much experience canning however, I do have recipes from experienced canners. Yesterday I did cold packed peaches and tomatoes. After 12 hours I pushed all the lids down and they stayed down. Why do you suppose none of my lids went down on their own? Is it safe to keep them? I’m so frustrated! Tiffany, I’m really sorry you had this experience. Without being in the kitchen with you, I can’t begin to know why your jars didn’t seal. My in-laws canned spaghetti sauce a few weeks ago. When I went to open one I could take it off with my fingers. Is this a good seal? The ones I can I can’t open with my fingers. I always use a can opener. The ability to remove the lid without much effort is the sign of a mediocre seal. I’m new to canning. I canned pickles and when pressing on the lid it is firm, but only some of the lids are concave. Does this mean that the jars that are not concave didn’t seal even though the lid is firm? Take the rings off and check to see if the lids stay in place. That’s the best, truest test. What your describing sounds like a reasonable seal to me. I wouldn’t throw that salsa out. I’ve canned off and on for many years so I’m not completely new to the process. However, while placing quart size jars filled with apple pie filling into the canner earlier today I thought I heard one of the seals pop at that time. I still processed the jar, and all seems well although it’s still too early for me to investigate the jars too directly. Does that ever happen? A seal can pop when it first enters the boiling water bath? It could have formed a weak seal if it was filled and sitting outside the canning pot for awhile. It’s not a big deal though. You can still process it at that juncture and thus ensure yourself a strong, reliable seal (rather than the weak one you’d have gotten otherwise). I canned pickled beets two days ago. I went to put then in the pantry and found one had not sealed. From what I have seen in your responses I should be able to put them in the refrigerator and they will be fine is that correct? Yes, you are still within the window where it’s safe to put them into the fridge.